Kick off this spectacular season with the Island of Lights Festival. The island-wide month-long event invites you to enjoy signature activities that are a twist to your traditional holidays. Experience floats that float at the Christmas Flotilla on Dec. 1 that brightens up the night sky along the Intracoastal Waterway with decorated and illuminated boats. On Dec. 8, venture through the Holiday Tour of Homes that showcases beach homes dressed in their festive best for the season. Walk through an aquarium turned winter wonderland during the Cape Fear Festival of Trees held at the North Carolina Aquarium at Fort Fisher. Wander through an elegant forest while viewing unique underwater animals that call the aquarium home, Nov. 19-Jan. 2. Enjoy the splendor of the holidays at this coastal tradition, the Kure Beach Fantasy Christmas Show on Dec. 7-9. Frosty and his penguin friend, The Grinch, Santa Claus and more entertain the audience with glistening lights, song and dance and more. Who knows, you might even experience a rare snowfall at the coast! Are you still searching for the perfect present for everyone on your list? 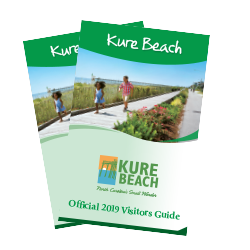 Mark your calendars for the Kure Beach Holiday Market on Nov. 24 to cross items off your holiday shopping list, oceanside. Browse through locally-made, handcrafted items from artists and enjoy music and food. Celebrate the season at the Fort Fisher’s Victorian Christmas Open House on Dec. 4 to enjoy holiday decorations, live entertainment of your favorite holiday tunes, refreshments, and an appearance from Father Christmas. Ring in the New Year in the sand during the Island of Lights Festival’s final event: Island of Lights New Year’s Eve Celebration. Toast 2018 during this family-friendly event that features dancing, refreshments, party favors, a raffle and a giant beach ball drop when the clock strikes 12.